My biggest regret is not having my dog at my wedding. It’s honestly the only thing about the big day that I wish I had done differently. Don’t make the same mistake I did, instead, here are seven ways to get those doggo’s involved. Everyone loves to watch tiny humans toddle down the aisle throwing things and carrying small pillows. The only thing potentially cuter than that, is your dog preceding you down the isle as your Flower Girl or Ring Bearer. 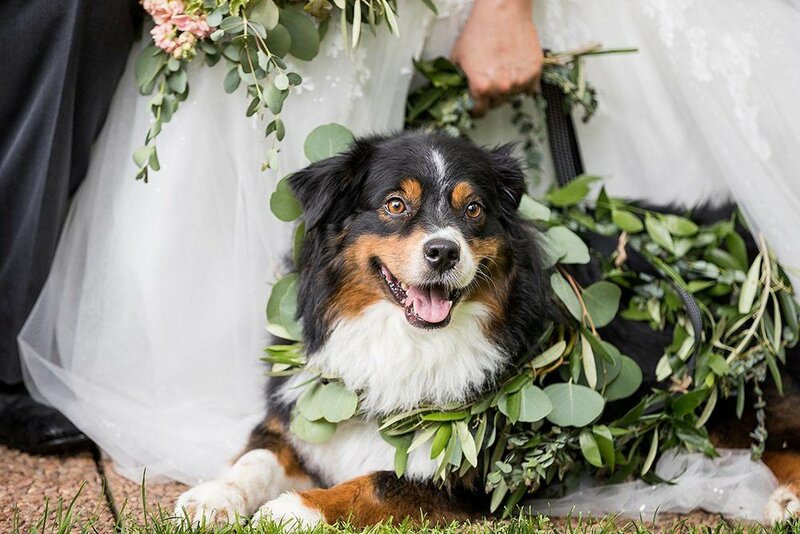 This bride included both of her furry family members in her special day with a unique and totally adorable collar and leash made out of greenery which reflects her wedding theme perfectly! 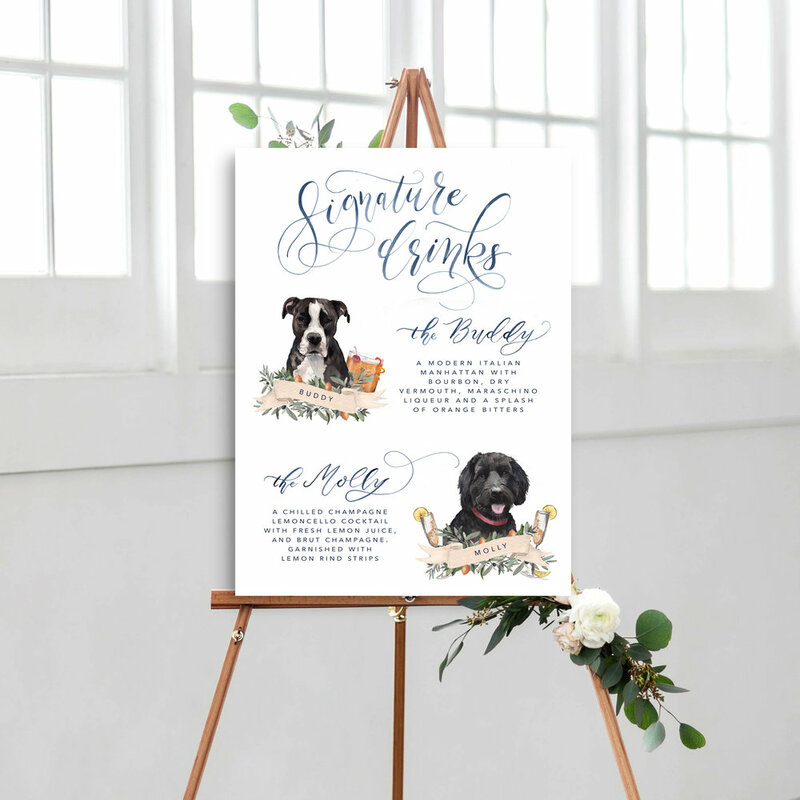 A fun sketch of your dog incorporated into your invitation can add the perfect personalized touch and tell the world how important your little dog is in your life. These one-of-a-kind designs are works of art by Cami Monet, a watercolor artist based in Florida. Cami creates unique, custom pet portraits that captures and reflects your pet’s personality! Who wouldn’t love hand painted portrait of their precious pup? Absolutely aww-dorable! I love the amount of detail that goes into these personalized crests and pup paintings. The best part about these designs is you can use them from Save the Dates, to invites, to wedding day papers and signs so you have a personalized and cohesive look throughout every stage of your big day. Father - daughter, Mother - son, why not Bride/Groom-dog? If your sweet puppy is already in attendance at your wedding, and fairly well behaved, take them for a small spin. No need to spend a whole song on it, as we all know how easily distracted they get, just tack on a little bit of time after your other couple dances to bring them out. 4. Incorporate them into your post-wedding thank you notes. This is especially doable if you take engagement photos with your pet in tow. Many couples snap a couple photos specifically with their future notes in mind, so go ahead and incorporate your pup and remind people once again how much you love your dog. You might get some gifts that your dog can enjoy, too. We received a bathroom rug form my aunt that immediately became my dogs go to nap stop. She’d never laid in there before, but once we had that rug we could always find her hiding out in her special new spot. When I wrote my thank you notes, I was sure to let her know how much the whole family loves the rug. Signature cocktails are a common addition to many reception bars. Instead of going with the usual “bride” or “groom” signature cocktails, pay tribute to your sweet puppy with a cocktail in their honor. If they can’t be there, you can at least introduce them to your guests in a fun and delicious way. Cami makes these incredible signature drink posters that include your furry friends. Especially if you’re not able to have your dog attend your wedding, this is such a special way to include them and have a forever keepsake. 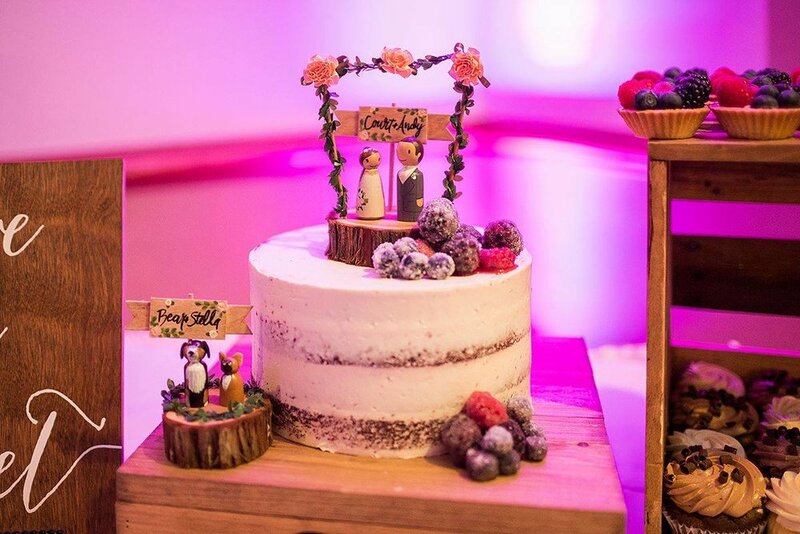 Standard store-bought cake toppers are a thing of the past. Personalizing your cake topper is one of the most fun ways to show the elements of your life that are most important to you. Getting a replica of your pet is the perfect way to commemorate your life on top of your cake. Courtney included her puppers on a little block next to the cake which is still SO cute. If you have a specific cake topper in mind, you can always make them a smaller cake, cupcake, or something like Courtney did! This one goes without any explaining. If your dog is present at your wedding, use it as an opportunity to document your day with all people and pets you love. Don’t forget to include your four-legged friends in a few photos during your engagement session, too!